KODAK INDUSTREX DR50 Film is specifi cally designed for use in multi-fi lm techniques in your demanding radiographic environment. With both high-voltage x-rays and gamma rays, DR50 will deliver consistently high contrast, very fi ne granularity, and superior sensitivity to meet your testing needs. It incorporates Carestream Health’s patented T-GRAIN Emulsion technology for superb results with direct x-rays or lead foil screens. DR50 Film is an extremely durable slow-speed film with very fi ne grain. It withstands high temperature and high humidity, and resists both handling and static artifacts. This fi lm is classifi ed as ASTM E 1815 Class Special and EN 584-1 Class 1. Aircraft inspection, Assemblies, Castings, Electrical components, Composite, fibre-reinforced, Forensics, Munitions, bomb disposal, Nuclear applications, Welded fabrication. DR50 Film can be processed manually or automatically in a range of processing cycles. Notice: Observe precautionary information on product labels and Material Safety Data Sheets. Develop with rack and tank, using properly replenished solutions. 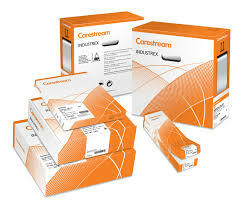 See Carestream Health publication TI-2621, Processing KODAK INDUSTREX Films, for additional information on automatic processing. ISO/EN exposure conditions: 200/220 kV, lead screens; KODAK INDUSTREX Single Part Developer Replenisher and KODAK INDUSTREX LO Fixer and Replenisher. 1 Contrast calculated between net densities of 1.5 and 3.5. See Carestream Health publication TI-2643, Guide to Manual Processing of KODAK INDUSTREX Films, for additional information on manual processing. Develop with rack and tank, using properly replenished solutions.